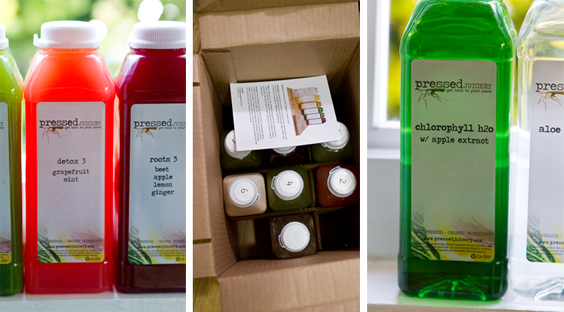 My Pressed Juicery 3-Day Cleanse. Juice Bonanza. "Our bodies require vital nutrients to function at their optimal levels, and the quickest and most natural way to get them is through fresh juice." - Pressed Juicery website. 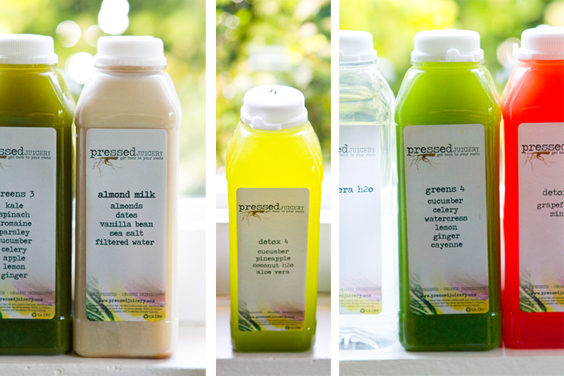 Last week I signed on to try 3-day juice cleanse via the Los Angeles-based company Pressed Juicery. The juice-guru trio behind the company: Hayden Slater, Carly Brien and Hedi Gores. The Pressed Juicery has locations in Malibu and Brentwood and just opened a new West Hollywood location (the first super fan customer of the day? Nicole Richie). Fresh off my 3 day juice-chugging bonanza - green, red, white, yellow and pink colored fresh juices on demand - at my fingertips - I can say I am a changed lady. And I have one new reason to love LA. Juice Journey. Although I not a juicing-newbie, during this cleanse I was shocked to discover a few new things about my body and juicing. 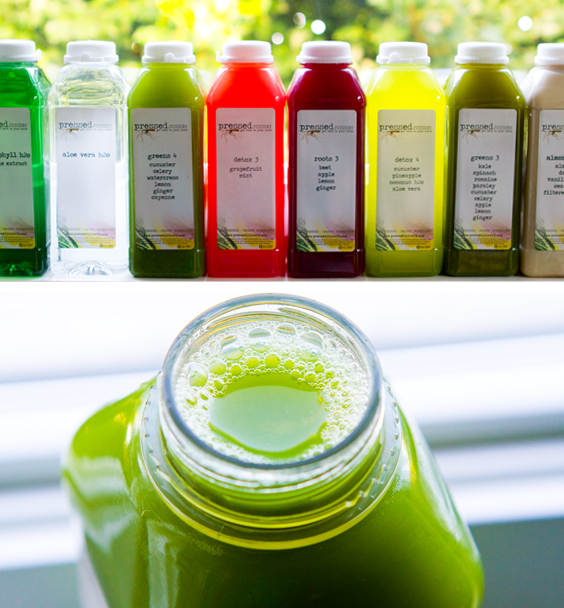 Get my story and lessons learned on my Pressed Juicery 3-Day cleanse..
Why Cleanse? 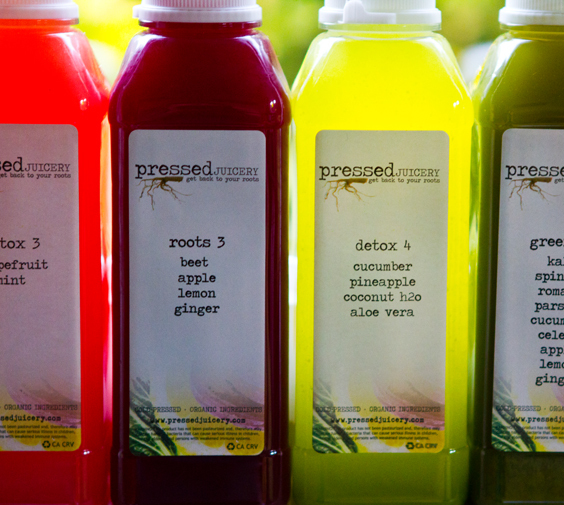 For complete info on why juice cleansing and drinking is awesome for your body, mind and spirit head over to the Pressed Juicery's website. It is packed with interesting tidbits and info on their product. Start with their "Why Cleanse?" page. The Pressed Juicery has been called "the modern day milkman - but for juice!" So true. And so much better than milk!! Let me paint the picture for you.. Cleanse Day One. 6am. My kitty dives under the covers of my bed and nuzzles up to my leg like a scared little sand crab. Snug and safe between the fluffy covers I pet her little head and say thanks for letting me know my juice has arrived for the day. I don't know how she heard the silent tip toe of the early AM juice delivery person out front - but she did. I climb from my bed and groggily stumble to the front door. I peek outside and sure enough the magical "juice elves" of the Pressed Juicery have left a very blissful gift on my doorstep. Fresh pressed juice. Juiced that morning. Made from organic ingredients (except in a few rare occasions when organic ingredients are unavailable). I open my door, a gush of crisp California fall morning air on my face - which feels quite nice actually - grab the cardboard delivery carton and whisk myself back inside to pile my fresh juices in the fridge. Day One. Juice One. I pop open my carton to reveal a juice pirate's treasure trove of goodies. I may have squealed in delight. I found the six juices I selected from the diverse Pj menu as well as two bonus beverages: Aloe Water and Chlorophyll Water with apple extract. Beautiful bright colors. 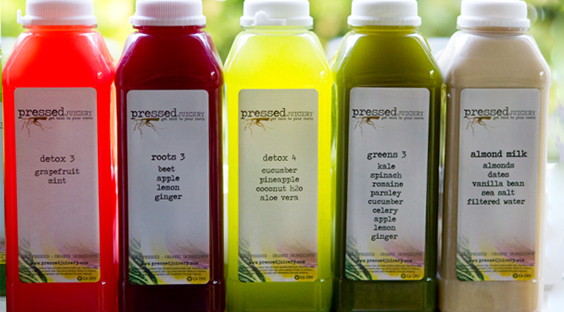 The best part about Pressed Juicery is the fact that they do not pasteurize their juices - they are raw and fresh. As you probably know, those popular store-bought juices are always flash pasteurized - heated - not raw. Raw juice is the same as you would get juicing at home with your own juicer and fresh ingredients. However, PJ uses this super awesome machine called a Hydraulic Press - it allows for optimal nutrient density and the least amount of oxidation. Inside my delivery box was also a handy little cleanse-guide card that gave me a quick intro and a few helpful tips and instructions on my cleanse. You can also contact the JP folks at any time with questions during your cleanse. For juice one, I grabbed the bottle labeled #1 and the rest was bliss. For the next three days, I was chugging juice after juice after juice. With a few of those lovely aloe and chlorophyll waters and their Almond milks in between. Here are some of the lessons I learned on this cleanse..
* The first day - especially in the morning hours - I was craving, no, pleading with myself for a hot beverage in the morning. Soy chai, herbal tea or a bold espresso soy latte. I wanted heat, sweet, creamy and caffeine. And I wanted it NOW. Lesson: I realized am (was) totally addicted to my morning mug fix. * Some people may think that you need to space your juices out evenly throughout the day. Well sometimes I'd drink 2 juices back to back then have an extra long time in between my next craving. Lesson: Listen to your body when juicing. There are no rules to the process. Simply give your body access to plentiful nutrient-dense juice and your cravings will do the rest. * Luckily, (no pun intended) I also had a delivery from OneLuckyDuck.com during my cleanse. So I had some raw snacks in the evening on that first day. The raw snacks of spicy cashews and hemp granola went perfectly with my juice. Lesson: If you have to nibble while on your cleanse try raw snacks - something salty like cashews was perfect for me. * The most shocking thing I found while on this journey was that my sugar cravings were gone. Like totally gone. I had been on a vegan frozen yogurt kick the week before my cleanse and all the sudden I didn't even want to look at the stuff. All I wanted was fresh greens, whole grains, and tons of that fresh-pressed juice. Lesson: Feeding your body a plentiful dose of good stuff, nutrients, antioxidants, enzymes from fruits and veggies will indeed make your body tune into its natural cravings for nutrients as opposed to its unnatural cravings for sugar, fat, caffeine and more. * As I mentioned, my husband was generously donated one juice a day by me. I gave him the pineapple, coconut water juice "Detox 4" since he loves coconut water and enzymes in fresh pineapple juice are very good for his winter allergies. He adored his juice. Lesson: Boys love juice. And even stubborn husbands may start to crave juice and yearn to satisfy their juice kick. Juice with the ones you love! * On day 2 I fell in love with my favorite drink. The Greens 3. It contains a laundry list of ingredients I adore. Ginger, romaine, kale, apple, lemon, spinach, parsley, cucumber. It has this salty, sweet, grassy, spicy, tart flavor that makes me feel awesome. It was labeled as juice #3 for the day - but I drank it first on days 2 and 3. Lesson: When doing a cleanse, you don't have to drink the juices in order. And when you find "your juice" - the blend that works for you - remember it. So those are just a few of my juicing revelations. The reversing of my "morning chai cravings" and "sugar cravings" is what startled me most. I have so much more energy throughout the day when I start with juice instead of a latte. Pressed Juicery Review. I've tried a lot of juice companies both for juice delivery and for juice bar juices) - some of them I adore like NYC's One Lucky Duck and Organic Avenue. And others I didn't really care for (won't name those). And hands down Pressed Juicery is at the very tip top of quality, flavor, and all around customer service satisfaction. I adored everything about my juice. From the daily delivery service to the bonus waters included in my cleanse. So if you are lucky enough to live in LA and curious about juicing, I would highly recommend trying Pressed Juicery. And if you are turned off by the price of "a few juices" just stop and think about what those juices contain. Loads of nutrients. In fact, if you really think about what you are feeding your body - the value in that - the juices come out to be a deal. A steal. And the home delivery service is a fantastic value compared to others I've experienced. The proof that I love this place?.. A few days after my juice cleanse ended and my plentiful juice was gone, I hopped on the computer with my husband and we had a serious discussion. A juice discussion. We decided that we felt so amazing drinking this juice that it was absolutely worth the investment to sign up for a monthly program. So that's what we did. As I am writing this, I am sipping my beloved Greens 3 juice that was delivered to me early this Sunday morning by the PJ juice elves.